The neck or Cervical spine is a working network of nerves, bones, joints and muscles which all coordinate together to provide strength, stability and nerve communication. The brain and the spinal cord are responsible for directing this effort, and when something goes wrong, all you’re left with is uncomfortable and inconvenient neck pain. Are you seeking neck pain relief in Loveland? Look no further than our walk-in services at Chironow Loveland. Our chiropractor would be more than happy to help you find a healthy, alternative solution than taking pain medications. A variety of conditions can occur in the Cervical spine, leading to a pain in the neck. Sometimes the pain is pinpoint and local to the neck. Other times, irritation along the nerve pathways can cause various symptoms including radiating pain, tingling and/or numbness in the shoulder, head, arm and hand. A stiff neck is another symptom of neck pain and can cause difficulty when trying to turn the head. Neck pain can have causes unrelated to an underlying disease. Examples include prolonged straining from activities requiring looking up or down for long periods of time, sleeping in an uncomfortable position, stress, abnormal posture or even something seemingly innocuous as wearing heavy necklaces and jewelry around the neck. 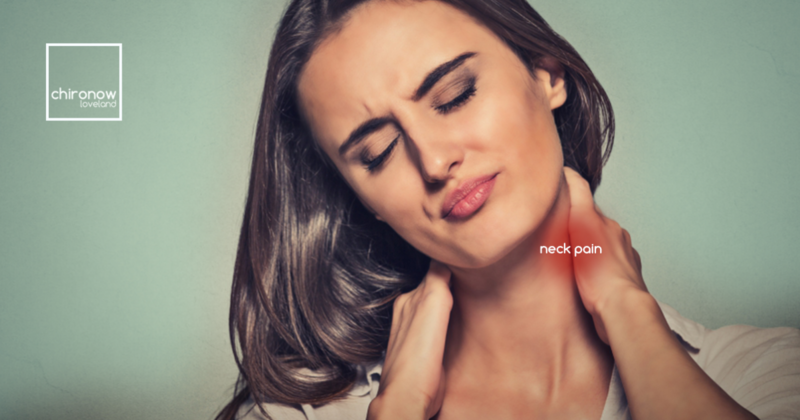 Most commonly, neck pain is due to a muscle sprain, which is a stretching or tearing of a muscle or tissue connecting the muscle to bone (tendon). Whiplash is a neck injury that can be caused from car accidents, sports, falls or other events causing the head to suddenly move backward then forward. Neck pain can also occur with arthritis, causing inflammatory conditions in the joints, leading to stiffness and problems that can worsen with age if left untreated. Chiropractic treatment is a conservative, natural, safe and effective way of treating and managing neck pain. It has been shown to relieve pain, reduce stress and improve the brain-body connection. This leads to a strengthened and improved immune system. Next time you reach for the coverup type of treatment from a bottle, think about trying a more permanent solution like getting an adjustment at Chironow Loveland. Our chiropractor, Dr. Ryan, was the junior chiropractic doctor for the Oakland A’s professional baseball team prior to moving to Colorado. He is able to provide sound advice and adjustments for injuries, as well as, musculoskeletal diseases. Stop in today — no appointment necessary. Let us help you relieve your neck pain.